1. Will you be Seeking Stanley…six weeks early? Yesterday, Chris and I represented CHB at the media launch for Seeking Stanley, the Saturday evening hockey show on CBC hosted by Shane Foxman and Karin Larsen. We had a great time meeting other media folk and meeting Shane, Karin and other CBC on-air personalities (I really enjoyed chatting with Gloria Macarenko as well…she is both lovely and personable…but I digress). 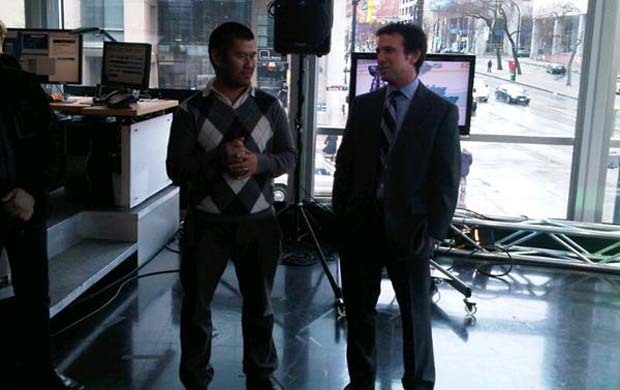 More importantly, we got to learn a bit about the CBC’s plans and high hopes for Seeking Stanley after a successful debut for the show during last year’s memorable Canucks playoff run. Seeking Stanley promises to be Canucks-centric and will start airing this Saturday already and will be on for the remainder of the season from 10:30pm – 11:00pm PST. With the Canucks playing on six consecutive Saturdays until the end of the season, viewers can look forward to a plethora of post-game coverage, analysis and interviews. We appreciated the opportunity to hang out in the studio over-looking the corner of Hamilton and Georgia. In fact, some of the most interesting stories were Shane Foxman’s recollections of the riots of June 15, 2011 as they had a perfect (yet dangerous) view of everything happening in front of Canada Post. Some other highlights: the free t-shirts, meeting other writers, my argyle sweater getting a bit of play on Twitter, and the delicious sliders. At the end, your favourite Canucks blog was the only ones left standing as we shut the place down. Coincidentally, it was about the same time that the food ran out. Seeking Stanley has a beauty as their first game this Saturday: it’s the long-awaited (haha) return of Cody Hodgson, Christian Ehrhoff and the underachieving Buffalo Sabres. 2. Showdown for first overall…with the Blues? Last week I wrote about the great anticipation for the Canucks-Red Wings tilt – one that saw the Canucks snap Detroit’s impressive 23-game home winning streak. Since then, the Canucks have leap-frogged the Red Wings in the standings. Meanwhile, another team has caught up to Detroit as well. Thus, tonight’s game between Vancouver and St. Louis is for first overall in the league. The Blues have quietly put together a remarkable season under coach Ken Hitchcock. They have the second-best home record in the entire NHL (26-4-4, just behind Detroit) and they have the stingiest defence, allowing a mere 1.91 goals per game. They are getting decent offensive production from David Backes, TJ Oshie, and young defencemen Alex Pietrangelo and Kevin Shattenkirk. Also, David Perron is having a strong season (with 13 points in his last 13 games) after missing the first two months with post-concussion syndrome. The goaltending has been stellar, with the tandem of Brian Elliot and Jaroslav Halak rivaling other combos in the league, including the one here. After a few years of being a good but not great team, the Blues have matured into arguably the hardest team to play against in the NHL. They lead the season series with the Canucks two games to one heading into tonight’s game. 3. A chance at immortality…at least for a few years. When I first joined CHB at the tail end of last season, the tagline on our website was: “We’ll be nice to Kevin Bieksa, we promise”. Bieksa’s emergence as a top-two d-man coupled with the potential in Cody Hodgson led to the change to: “The Cody Hodgson Era Begins”. Well, the Hodgson era (here at least) was a short one. So now, we’re looking for a new tagline. Per Chris’ post yesterday, we’re giving you a chance to offer suggestions. If we end up picking yours, you will win a $25 gift certificate to the Donnelly Group. More importantly, you will know that your contribution will be viewed by the thousands…or at least hundreds…of CHB visitors every single day. Think you have what it takes? Then see all of the details here. Thanks for reading. I’ll be at Rogers Arena for both tonight’s game against St. Louis and Saturday’s game against Buffalo. Send me a tweet if you’re there too and maybe we’ll pass each other in the concourse. Or at least we can pretend we did.